Participants of this year's pilgrimage gather in front of the Basilica of the Immaculate Conception. On Saturday, September 24, Chaminade High School participated in a pilgrimage that sent a group of Flyers to the Basilica of the National Shrine of the Immaculate Conception in our nation’s capital. The thousands who went “came together to express their devotion to Christ and to his Blessed Mother,” said Bro. Stephen Balletta ’74, who helped organize Chaminade’s part in the trip. Affectionately called “Mary’s House,” the Shrine as well as the many chapels within are dedicated to the Blessed Mother. After five hours on the road, the Flyers arrived at the shrine and gazed in awe at the beautiful dome and bell tower of the building. After meeting and taking a picture with Bishop Robert Brennan, they moved inside and entered the main church. Bro. Stephen explained to the pilgrims the story of the Holy Door, which was opened for the Year of Mercy on Papal Decree to provide indulgences to all who walk through. The Flyers then explored the chapels of the shrine, a large part of them dedicated to Mary. “Seeing all the the statues of Mary with all her international devotions really opened my eyes to how universal the Church really is,” remarked Anthony Hubner ’17. 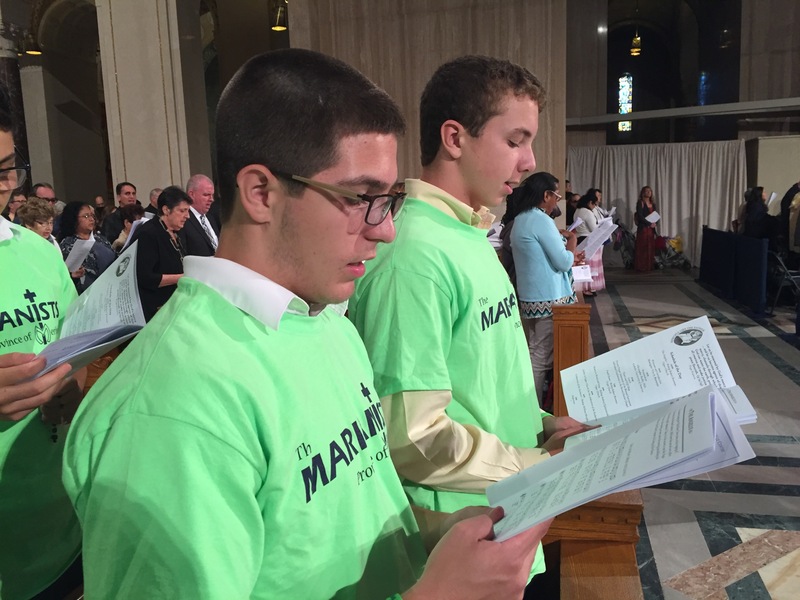 Nicholas Balylis (l.) and Sean Cunnane (r.) sing at Mass during the pilgrimage in Washington D.C.
As the bells struck noon, the pilgrims gathered in the Church to pray the Angelus and listen to Dr. Christopher Ruddy, a professor at the Catholic University of America, who reflected upon the theme of the Mercy of God. Dr. Ruddy, drawing inspiration from the Parable of the Prodigal Son, reflected on the Merciful Father who welcomed his son back after his sinful past. He then challenged those in the pews to act like the Merciful Father at all times. After the professor finished his reflection, the pilgrims were dismissed for lunch, further tours of the Church and other religious activities such as confession and adoration. “The mosaics of different biblical figures and scenes helped enhance the experience of strengthening my relationship with God,” said Ryan Schmidt ’19. On the tour, a particular point of interest for the Chaminade students was the exhibit dedicated to the Popes who visited the basilica. On display were the various chairs used by Popes, as well as the Papal tiara of Blessed Pope Paul VI. Additionally, many pilgrims enjoyed taking pictures with the cardboard cutout of Pope Francis, which was next to various objects left from his visit in 2015. After they finished their confessions, tours and lunches, the Flyers, along with other Catholic high school students from Long Island, gathered in the Crypt Church to partake in a prayer service, which consisted of the exposition and adoration of the Eucharist. Fr. 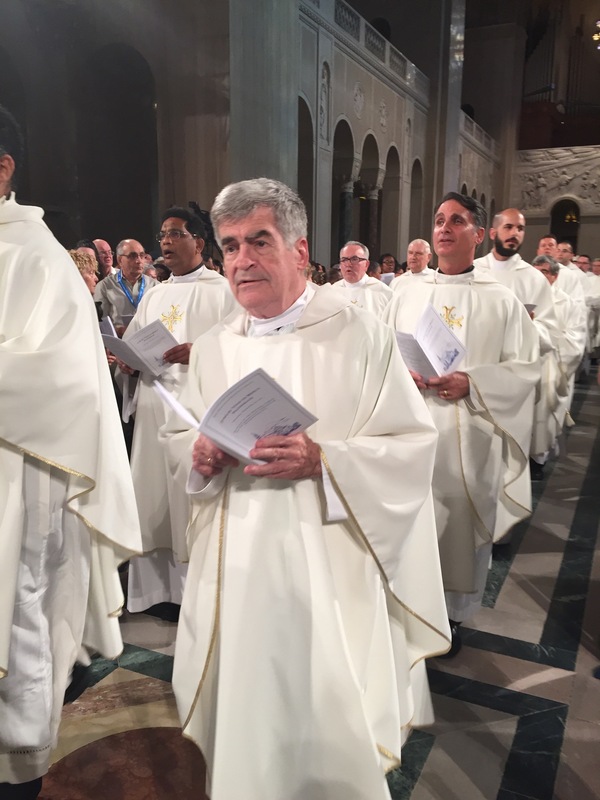 Garrett Long participates in the closing Mass of the pilgrimage. The Flyers said goodbye to the basilica and got on the bus once more for the ride home. On the long bus ride home, the Flyers engaged in playful banter as the day winded down and they arrived, at long last, home. “Mary’s home is our home,” said Bro. Peter Sennert ‘10, an alumnus of the nearby Catholic University. “This pilgrimage was very much a homecoming.” These views were shared by all of the pilgrims who were able to partake in the journey. The Flyers embraced the message of Mercy put forth by Bishop Murphy and Dr. Ruddy with “enthusiasm and fervor,” according to Bro. Stephen. The Year of Mercy pilgrimage was a great success for all involved. The pilgrims were rejuvenated with the Holy Spirit and received the great Mercy of God all while having a great time. Posted in News and tagged pilgrimage, spirituality. Bookmark the permalink.